We are pleased to announce that Airport in the Sky, with its newly-repaired runway at ACE Clearwater Airfield, will open to the public at 3 p.m. on Friday, May 3. This reopening marks the culmination of an innovative group effort to enhance the experience at Catalina Island’s only airport. Through a unique partnership between the Conservancy and the Department of Defense, a total of nearly 200 Marines and Seabees were deployed to Catalina Island over a three-month period to replace the main runway’s asphalt with concrete as training for future missions. The Runway Repair Project was conducted as an Innovative Readiness Training (IRT) project through the Department of Defense. The airport’s main landing strip has required frequent patching, costing the Conservancy about $250,000 a year in labor and materials. The California Department of Transportation’s (Caltrans) Aeronautics Division issues a public use permit for the airport and annually inspects the Airport in the Sky’s runway. Caltrans had told the Conservancy that it needed a long-term repair plan in place by September 2018 to continue to operate the airport as a public airport. 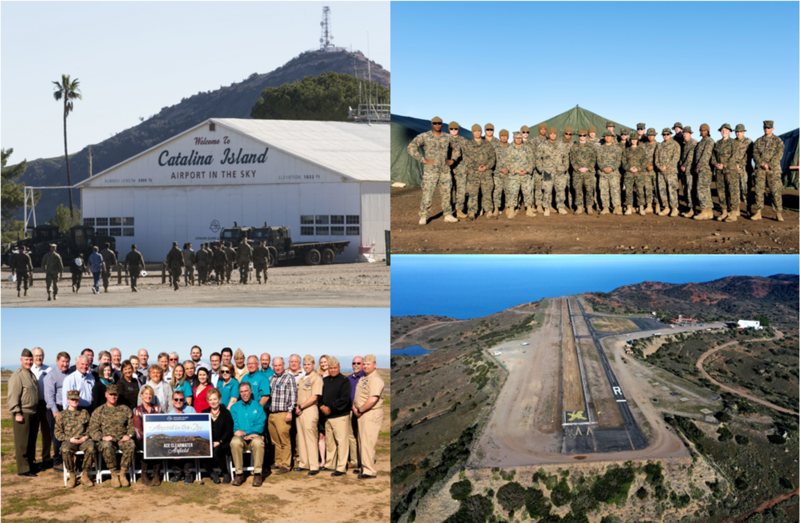 This IRT project provided the military with valuable construction training while benefiting the community of Catalina by ensuring that the airport remains open to the public. This innovative partnership has attracted local and national media coverage. Please see the print and broadcast stories below.